WHAT IS A COMPRESSION PEDAL? The guys over at Pro Guitar Shop have a great write up on what a compression pedal is and the different types of compression pedals. You can read that HERE. I found it very helpful and informative. The short version is that if your guitars sound is like water traveling through a pipe, a compression pedal controls how big that pipe is. How big the pipe is will effect how big or small the size of the (sound) wave will be as the water travels. Basically, you’re louds aren’t as loud and your quiets aren’t as queit as the compressor “squashes” the sound wave. Another way to think of it is that compression’s effect is felt more than heard as it doesn’t affect the shape of the sound wave, but it’s size. HOW DO YOU USE THEM IN A WORSHIP BAND? This is the primary way I use my compression pedal. I set it to a very mild setting. The goal is just to balance out the sound. The low strings won’t dominate the high strings when I’m strumming a chord. The edge is shaved off a little between my quiet and loud playing. Again in this set up the effect is really felt more than heard. If you have a two knob pedal (MXR DynaComp, Analogman Comprossor, Keely Two knob, etc) you set your sustain or comp knob to taste and then use the Volume or Level knob to get yourself to unity gain. I usually try to tell my sound guy if there’s a song where I’m going to finger pick or play lightly and so they need to bring me more to the front of the mix. But I’ve learned over the years which sound guys I trust and which haven’t learned why this matters yet. Then there was the time a few months back when our sound guy didn’t show up. Using the compression pedal here is more like a volume boost. I set it up to maximize the sound for finger picking, and activiate it only on that song. You can use the comp pedal for a volume boost in other situations, but it’s not my prefered method, and I prefer to use a guitar’s volume knob or a dedicated clean boost. Some brands comp pedals like Mad Professor or Boss have sustain modes that shift the pedal from a compressor to a sustainer. Other pedals like the MXR SuperComp or the Keeley Four Knob have an Attack control where you can very easily move the pedal from compressing to sustatining. This is great for soloing or adding a little life to a dull pickup. A lot of players also find they prefer this set up when using a guitar with Humbucking pickups. Chicken Pickin is a style of playing associated with country music. You can do it without a “squashed” compressed sound, but a good compressor pedal really makes that style of playing sound great. For this reason, comp pedals get a lot of play with Country players. Since a lot of church music has it’s roots in gospel and southern music this effect can come in really handy. I personally like most types of compressor for this except the Optical style, but that’s just a personal preference, and who’s to say that there isn’t one out there that I haven’t tried that will work great. As I mentioned above, you can dial a compressor in to be a volume or clean boost. You can also dial then in to drive your tube amp into break up. This isn’t my prefered use of the effect, but it’s by no means the wrong way to do it, and you may find you like the sound quite a bit. Especially in a church envrionment where less is often more when it comes to gain and overdrive. The other side of “drive” with comps is that since it will limit how loud you get, you can play harder without going louder. I do like this effect, amps will do this naturally at higher volumes, but here you can use it as lower volumes. It very pronounced in John Lennon’s early Beatles records, where the old Rickenbacker guitars had a comp cirucit in the pickups, so when Lennon played hard and fast it had a great driving sound. Ultimately that’s up to you. Going for $50 or less on eBay, you’re not risking much picking up the classic MXR DynaComp. I think the thing to do it go out to your local guitar shop and try a few, and see what works for you. I’ve owned a lot of compression pedals as I’ve either upgraded or tried different styles. 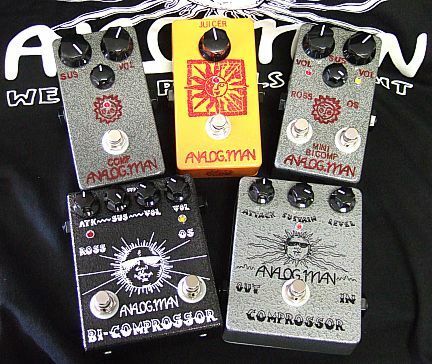 I like things about each one I’ve owned, and I like things about each style of compressor. I’ve owned (in order) the MXR SuperComp. Keeley Two Knob. Mad Professor Forest Green Compressor. Currently I use the Analogman Mini-Bicomp which has two comp cirucits. The 1st is a clone of the old Dan Armstrong Orange Squeezer which is a really nice bluesy comp with a little bit of grit. The other is his take on the classic Ross style circuit. It also has his “Ryck” mod switch, which makes the Ross side mimic the comp circuit found in vintage Rickenbacker pickups. Below I’ve posted a Rundown of Keith Urban’s guitar amps and pedals. The whole thing is very informative (I like his teach’s thoughts a lot). But the section on the different types of comp pedals he employs is very insightful. Questions. Comments? Feel free to join the conversation in the feedback below. So when you use your compressor for Subtle Balance, do you leave it always on? Yes, I basically leave it always on. This is actually “dangerous” in that I sometimes forget to check and see if compression would be better left off on a given song. That’s why it’s a subtle setting so that even if it’s not the “best” thing, it’s not gonna get in the way too much. “Always on” needs to be treated carefully.